Microsoft Surface Pro, an Ideal Mobile Video Editing Machine? 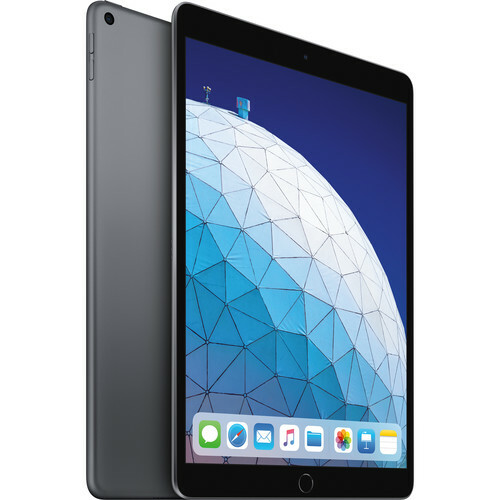 The 10.5" iPad Air from Apple, updated from the same one you know and love, features a few improvements to provide you with a better experience. The previous A10 Fusion chip is replaced with the A12 Bionic chip, which is more powerful and supports Neural Engine machine learning. Its 9.7" Retina display now measures 10.5" with a 500 cd/m² brightness rating, a 2224 x 1668 resolution, wide color coverage, True Tone technology, and an anti-glare coating. Lastly, for all content creators, the iPad Air now supports the first-generation Apple Pencil, so you can write and draw freely. Other integrated features include its front 7MP FaceTime HD camera, 8MP rear camera, and a 3.5mm audio jack. This iPad comes preloaded with iOS. Please check your device settings for the latest available update. The Apple A12 Bionic Chip with Neural Engine utilizes real-time machine learning to enhance everything you do such as photo editing, gaming, 3D modelling, streaming videos, and more. Meanwhile, its quad-core graphics engine gives you the power to enjoy augmented reality experiences, photo-realistic effects in 3D games, and details graphics within apps. The iPad Air has a 10.5" Retina Display with P3 wide color gamut coverage for vivid colors. It also has True Tone, high brightness, and an anti-glare coating for better viewing. True Tone optimizes the white balance of the display to best fit your ambient light, so it's easy on the eyes. Whether you're taking selfies or pictures of the world, the iPad Air has you covered with a front 7MP Facetime HD camera and a rear 8MP camera. Capture pictures and videos in 1080p, and even in slow motion at 120 fps. With the power of the A12 Bionic chip and front- and rear-cameras, you'll be able to experience augmented reality in games, apps, and more. If you want to write or draw, the iPad Air supports the first-generation Apple Pencil, so you can create freely as if you had a pen and paper. Like every Apple product, the iPad Air was designed with your privacy and security in mind. Touch ID makes unlocking your iPad Air simple and secure. You can make purchases conveniently and safely with Apple Pay. Just place your finger on the Touch ID sensor and you're good to go. Apple believes technology is most powerful when it's most accessible to everyone. That's why the iPad Air comes with accessibility features that support vision, interaction, hearing, and learning needs such as VoiceOver, which tells you what's happening on your screen, and Switch Control, which lets you interact with your device without touching it. Box Dimensions (LxWxH) 10.4 x 7.3 x 1.95"
Can I download photos,songs and other information contained in my i mac and i phone to this i pad ,and if the answer is yes;how do I do this? How do I transfer photos,songs,and other data from my I mac and I phone?